'[Georgia Maguire's] overall narration is calm and elegant but emotional and alarming during the horrific moments Grace experiences.' - AudioFile Magazine on Behind Closed Doors. Cass is having a hard time since the night she saw the car in the woods, on the winding rural road, in the middle of a downpour, with the woman sitting inside-the woman who was killed. She's been trying to put the crime out of her mind; what could she have done, really? It's a dangerous road to be on in the middle of a storm. Her husband would be furious if he knew she'd broken her promise not to take that shortcut home. And she probably would only have been hurt herself if she'd stopped. Well I liked it but not as much as I had thought I would. The ending wasn’t much of a surprise and it was rather flat. No full closure. I loved that I kept thinking along the way I had figured it out and I was wrong! Love a good mystery. Loved the narrator. Loved the story. I only wish the ending was a little more in depth. Left unsatisfied. 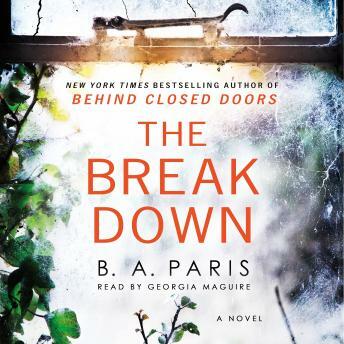 I loved listening to Behind Closed Doors and The Breakdown did not disappoint as a follow up! Such a good twist and kept me on my toes, listened to it quickly! So good! Loved the last book and this one is amazing too. Definitely didn't want to get out of my car- couldn't wait to hear what happened next!! This is a wonderful book, I really enjoyed it. It weaves a great tale and keeps the reader eagerly involved. I loved this book - and love this author. I read Behind Closed Doors by her and I enjoyed it just as much. I couldn't put it down and am looking forward to her next book. Excellent read. Slightly repetitious at the start, but great plot line. Kept me in my car for longer than I intended!